Find out how Aino collections are made and where designers find their inspiration. AINO Media tells you the story of the AINO brand through articles, images and videos. Find out how collections come together, the origin of the materials used, and where designers find their inspiration. 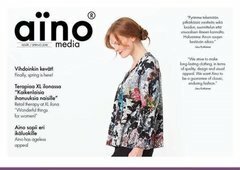 AINO Media brings you fashion trends, interesting people, and gives you the insider look at AINO’s retailers.